McCormick Ground Black Pepper comes from the dried berry of a perennial vine piper niger. Black pepper is the most widely used spice in the world, and adds excitement to just about any food. 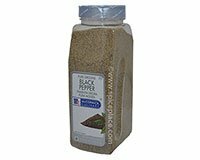 This is a large foodservice pack size of McCormick Black Pepper and contains 1lb 2oz of ground black pepper.